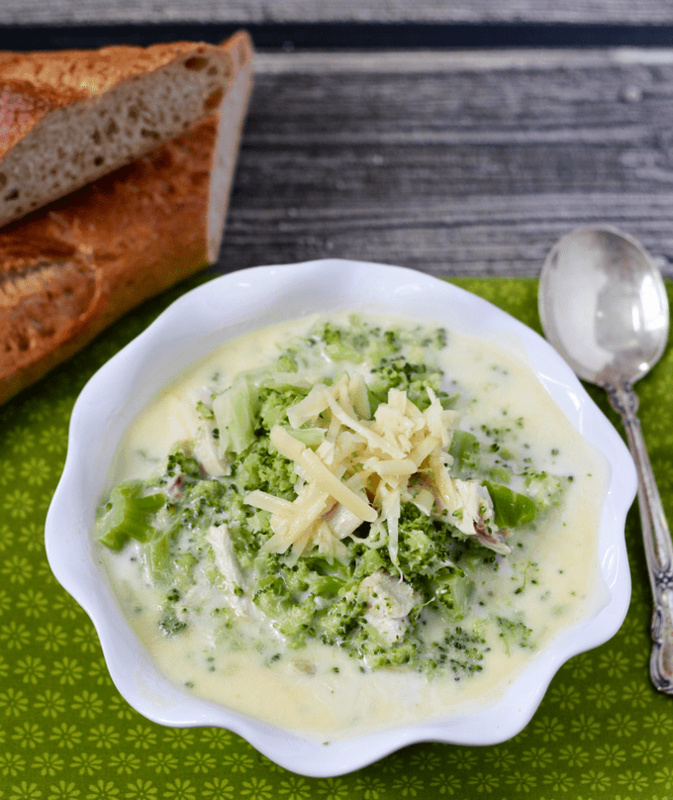 This filling, warm cheesy chicken broccoli soup is ready in just 20 minutes! Soup season is such a cozy time of year. I think big, warm sweaters (or pajamas or sweats, depending on how I’m feeling), layers of blankets, a fire in the fireplace if I’m lucky, and a big bowl of steaming, hearty soup. Hello, comfort! 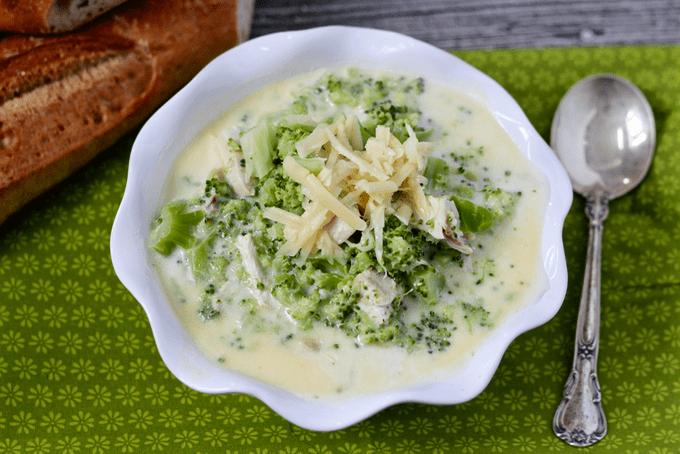 This cheesy chicken broccoli soup is classic comfort food. 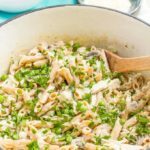 You can use leftover roast chicken or pick up a rotisserie chicken at the store. No cooked chicken? 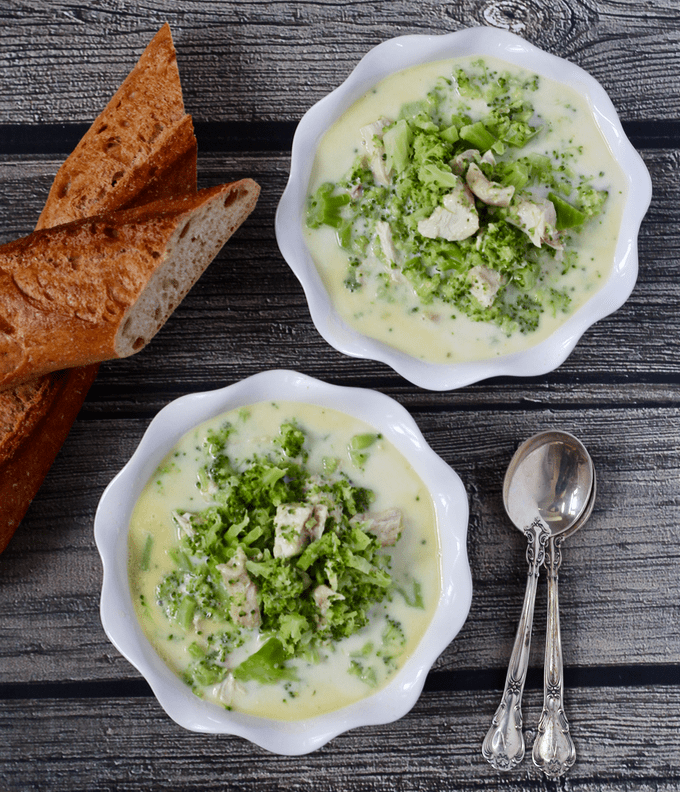 Just poach some chicken breasts in water on the stove before proceeding with this recipe. 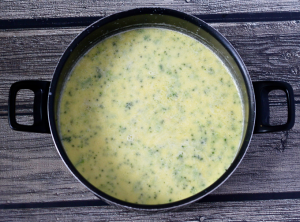 I lightened this soup up using 2% milk and fat-free half-and-half. Use what suits you! 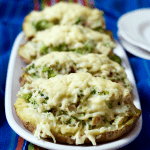 The gruyere cheese here adds such great richness and depth of flavor. Highly recommend, but if you’re not a fan, you could try this with cheddar cheese instead. 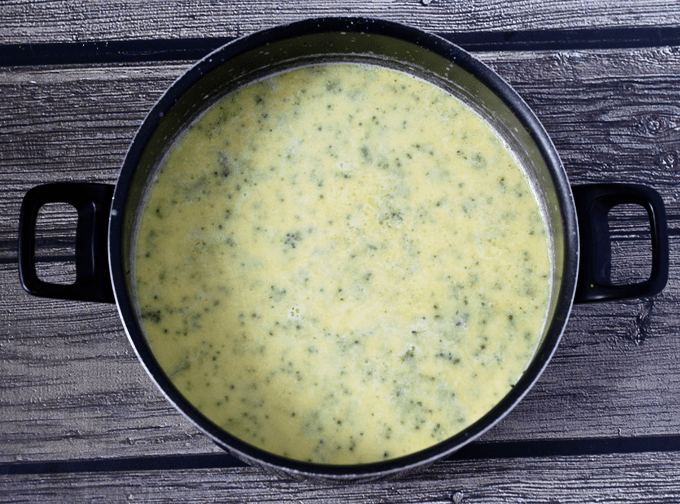 Be sure to add some crusty bread or rolls — or just crackers if you prefer — to pair with this soup. 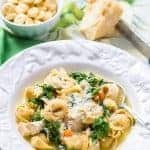 My 20-minute chicken + tortellini soup is as quick + easy as this recipe. 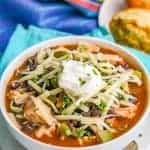 For really hands off, my slow cooker chicken, black bean and roasted poblano soup is a favorite. 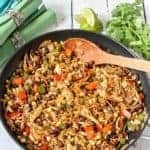 My hobo stew is a great budget-friendly recipe using ground turkey – or leftover Thanksgiving turkey! Mmm, soup season. Such a lovely time of year. 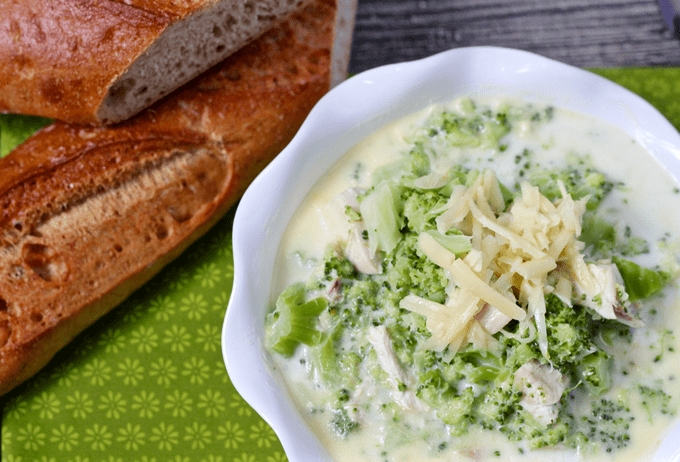 This filling, warm cheesy chicken and broccoli chowder is ready in 20 minutes! Heat 2 cups of the chicken broth in a large pot until boiling. Add broccoli florets, cover and let cook for 5-10 minutes, until tender. 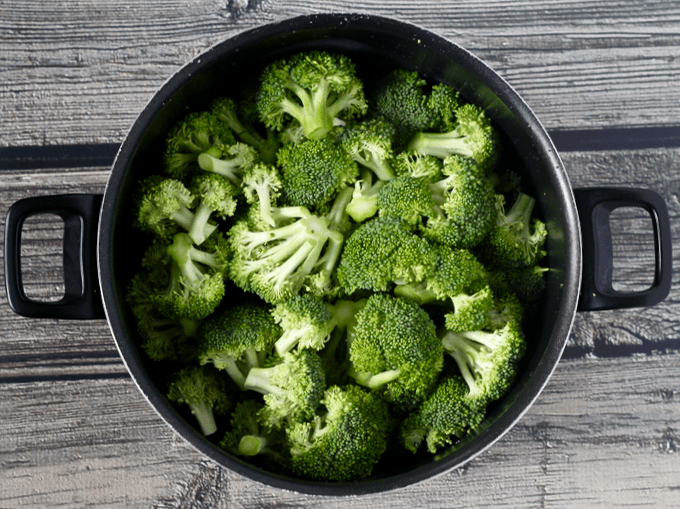 Remove broccoli with a slotted spoon (leaving the broth in the pot) and set aside to cool slightly before chopping the broccoli. 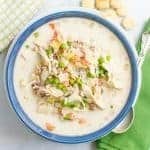 Meanwhile, add the remaining 1 1/2 cups chicken broth to the pot along with the milk, half and half, chicken, salt and pepper. Stir to combine and heat over medium for several minutes. Add the chopped broccoli (watch for splatters!) and stir until everything is combined and heated through. Add the cheese and butter, stirring until melted. Ladle the chowder into bowls and serve with extra cheese, if desired.